Training is about conditioning the body to do what it can’t do by itself. Spiritual training is conditioning your spirit to respond in ways it can’t do by itself. It is about putting into practice some training that will train us to respond more like Jesus, more of the time. At Encounter we believe that growing to be more like Jesus in every sphere of life is what a life of faith looks like, but its not about just trying harder. It’s about creating space for God, to tell us what to take off, and what to put on. Each year at Encounter we will run weekends to help you experience some of the many unique exercises you can put in place for becoming more like Christ. 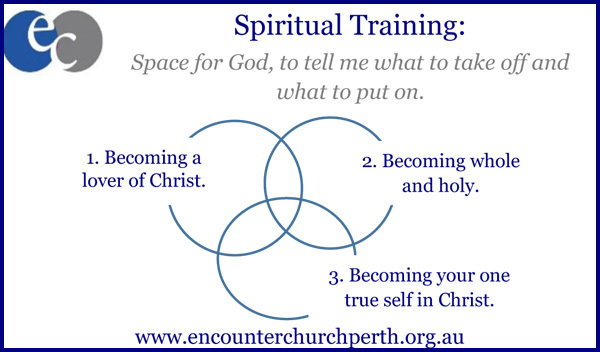 Spiritual training or discipleship, as you may have heard it called, should not be a tick a box exercise, but a life of responding to Jesus, in the context of relationship, in how He is wanting us to grow. When we actively put training in place to respond to what area of our life,the Holy Spirit is prompting us to grow in, we see great change. 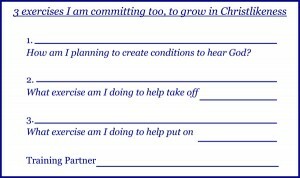 Below you will see a our training card, this is your card to write down what area you feel God is asking you to grow in, this season. There are also 5 messages to explain this process of creating a lifestyle of listening to God. Download the spiritual training card (pdf) here. Becoming a lover of Christ is all about creating space to disconnect and disengage from unhelpful life patterns so that you have space to hear, rely and be fed by God. The training exercises that make up this circle are known as the central disciplines. They include things such as solitude, silence, scripture memorization and fasting. From your space with God, we believe He will begin talking to you about things that need to change in your life for you to grow into being more like Christ. Colossians 3:5-11 talks about a few of theses areas but it is not limited to those. The key is that God will let you know what he would have you take off. Once you have established that there are plenty of exercises that you can put in place to help train your spirit to respond more like Christ in that area. The other thing that God has in store for you as you create space to hear Him is His design for you also involves putting on you ways of doing things. Colossians 3:11-16 mentions a good list of things, but your growth is not limited to that list. As God highlights which area to grow in and when there are plenty of exercises to put in place to help train your Spirit to respond more like Jesus more of the time. 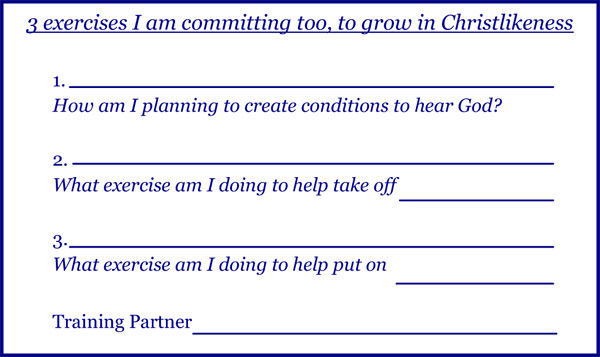 The training Card is a simple way of remembering what God has spoken to you about and subsequently what you have committed too to help you grow to be more like Christ in all spheres of life.